In today's post we are going to be talking about learning and applying a great four-bar phrase from Philly Joe. You can hear this phrase twice starting at 3:51 in the recording above, which incidentally is from the album "Kelly At Midnite" that I recommend everyone check out. 1. The most technically demanding part of this phrase is the left-handed triplet, so I would recommend getting comfortable with this by running through some "Syncopation" reading exercises with your R.H. playing the written line over the L.H. triplet. If you want to get fancy with it you could even do short notes as hi-tom and long notes as floor-tom with your R.H. Do this until you don't have to think about the L.H. anymore and can focus on hearing the R.H. melody. 2. Once that feels easy at around 130 bpm, take this phrase through the exercise I explained here. If you go to the final third of the video I talk about trading 4's with myself while singing the melody. I would strongly recommend doing an exercise like this with today' phrase so that you can hear it in more context. In a previous post I talked about Clark Terry's famous 3-step process for learning jazz: Imitation, Internalization, and Innovation. So following this process, the next important question after you have learned and internalized this phrase (and anything else for that matter) is what do you do with it? 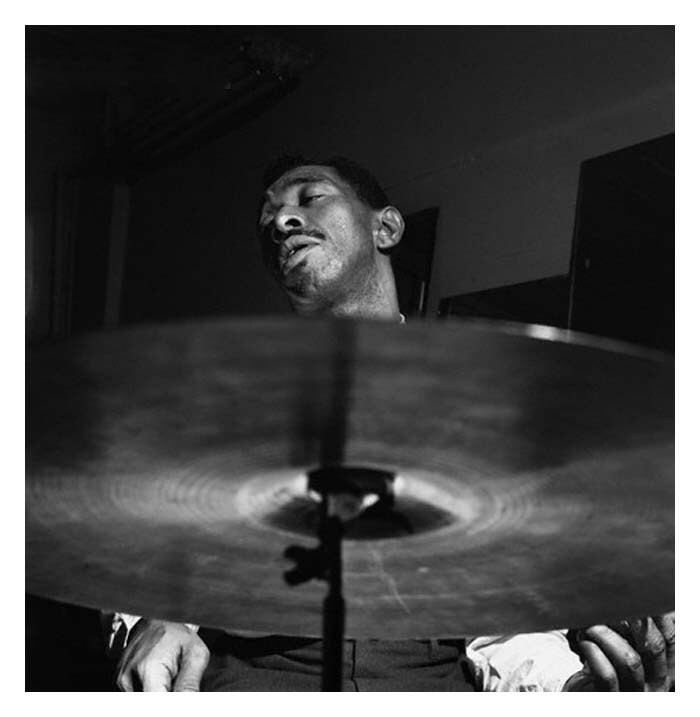 In other words, the end goal of learning this vocabulary is not to sound exactly like Philly Joe Jones, although striving to get as close as possible is an important part of the process.